Small cruise ships will dock in Ischia Porto, while larger ships are likely to dock at Ischia Ponte near the Aragonese Castle. 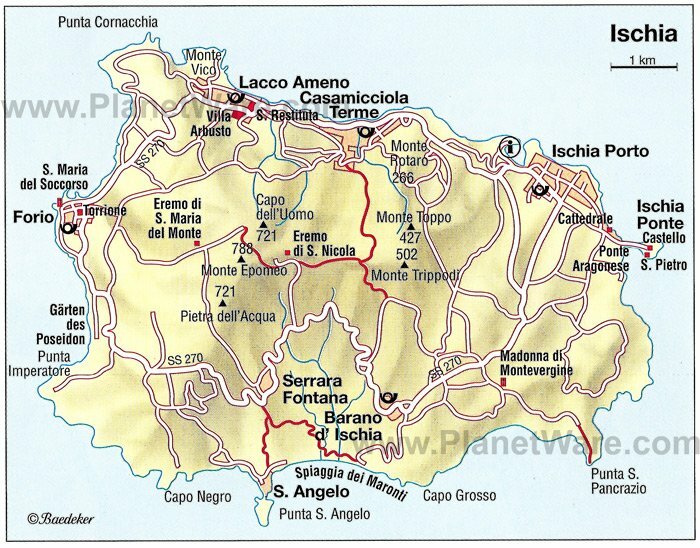 From the port it is a short walk to Ischia Ponte, the older quarter of the main town. A small stone bridge leads you to the stunning Castello Aragonese, which dates back to 1441 and can be reached by a lift. Those who want to do the journey on foot can follow an old donkey track. Lido di Ischia: this beach is just a short walk from the center and has several sandy beaches divided by rocks and pine forests. the most famous beach is the "Spiaggia dei Pescatori" that stretches out from Ischia Porto to Ischia Ponte. From Ischia Port you can find buses that drive around the island. They leave every few minutes. For example a bus to a neighboring town called Forio. It is a pleasant little seaside town with open air markets and street side cafes. There is a historic castle to visit. You may enjoy lunch at an outdoor cafe with views of the water. From Ischia Port, you can find also many boats available to take you around the island. It is a wonderful trip. The boat will stop in the major ports like Casamicciola and Forio to pick more passengers. Then the boat will tie up in Sant Angelo and you will have time to go visit this other port town. If you would like to do this tour, just come to Ischia Port around 9:00 am and look for the boats lined up. You could buy tickets in advance, but with the number of boats lined up ready to go, there is really no need. The tour will take you completely around the island and bring you back to the starting point. An enjoyable day trip! Shopping in Ischia can be classed into two categories: local products and luxury accessories. The latter is not much different from other towns: in fact, the island has several famous name boutiques filled with Italian and international fashions, mostly concentrated in the trendy streets of Ischia Porto: Via Roma and Corso Vittorio Colonna. Those interested in handcrafted objects can buy baskets, lamp shades, hats and other items made from plaited straw following an antique island tradition that has been passed down the female generations. The use of terra cotta is also an antique island tradition: there are still craft shops today that sell handmade items such as vases, cups and other ornaments. Many local recipes use rabbit which live in the wild in the local woods (also full of mushrooms, berries and strawberry trees), but that have also been bred for centuries in pits dug out in the country, or kept in cages. Practically every family and trattoria prepares "Ischia-style rabbit", which is made with garlic, wine, cherry tomatoes and aromatic herbs. Goats and sheep are raised on the island, and their milk is used to make rare cheeses. Pigs are also raised, and their meat is used for tasty sausages. There is a town between Barano and Serrara Fontana called Buonopane (good bread). Here they have been making bread for centuries. Cooked only in wood ovens it is kneaded with the "crisc'to" a natural yeast of acid mother paste. The bread is still kneaded by hand, All over the island there are ovens making bread. Imagine the nice smells in the morning. There are many webcams on the island.